For the first part of his career, the young left-hander was wild and lacked command. But when he figured it out, Sandy Koufax became the stuff of legend. More than 50 years after he pitched his last game, Sandy Koufax still remains the standard for ultimate in excellence on the mound. He also serves an example for his decision to skip a World Series start to observe Yom Kippur. 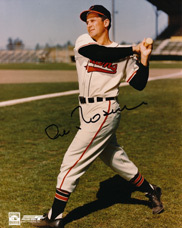 The era also produced other memorable players, including Al Rosen, who had perhaps the greatest season ever for a third-baseman. Quite simply, nobody was better. 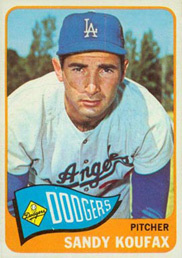 Beginning in 1961, Koufax won three Cy Young Awards, NL MVP in 1963, and two World Series MVPs. 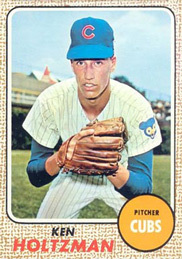 Oh yes, he also threw four no-hitters and recorded 382 strikeouts in 1965. Even though arm problems forced him to retire at age 30 in 1966, Koufax's short, but unparalleled run of dominance will live on for generations. After Koufax and Greenberg, Rosen probably is the next greatest Jewish baseball player. He likely would have been a Hall of Famer if injuries hadn’t cut short his career. However, his career flies under the radar a bit. A third-baseman, he nearly won the Triple Crown en route to being named AL MVP in 1953. He also went on to have a noteworthy career as a baseball executive. He was the GM of the Giants team that went to World Series in 1989. The left-hander from St. Louis wasted no time showing his potential. 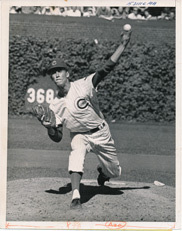 In 1967, he went 9-0 with the Cubs at the age of 21. In 1969, he pitched the first of his two no-hitters in defeating the Braves. A relief pitcher for the Dodgers, Sherry was the MVP of the 1959 World Series against the White Sox. He had two victories and two saves, accounting for all four Dodgers victories. He also was a brother of Norm Sherry, the catcher who is credited with giving Sandy Koufax the pitching advice that turned around his career. Tagged with the nickname “Super Jew” because of his tape-measure power, Epstein came into his own in 1969. Working with Washington Senators manager Ted Williams, Epstein hit a career-high 30 homers with 85 RBIs. Shamsky endeared himself to New Yorkers forever for being a key role player on the 1969 “Miracle Mets.” For the season, he hit .300 with 14 homers and 47 RBIs in 100 games. Then he shined in the NLCS against Atlanta, hitting .538 in the three-game sweep. The only time I really try for a strikeout is when I'm in a jam. If the bases are loaded with none out, for example, then I'll go for a strikeout. But most of the time I try to throw to spots. I try to get them to pop up or ground out. On a strikeout I might have to throw five or six pitches, sometimes more if there are foul-offs. That tires me. So I just try to get outs. That's what counts - outs. You win with outs, not strikeouts. TRYING TO HIT HIM WAS LIKE TRYING TO DRINK COFFEE WITH A FORK. There's a time that you let it be known that enough is enough (on anti-Semitic taunts). ... You flatten [them]. Pinch hitter Lou Limmer faced pitcher Saul Rogovin and catcher Joe Ginsberg, the only all-Jewish pitcher-batter-catcher confrontation in major league history. Limmer hit a home run. In a close play at first on his final at-bat of the season, Al Rosen is thrown out, denying him a hit and a chance to win the Triple Crown. He loses the batting title to Mickey Vernon by .0011. 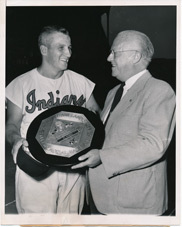 Al Rosen hits 2 homers and drives in 5 runs in the American League’s 11-9 win in the All-Star Game in Cleveland. Sandy Koufax makes his big-league debut, pitching two scoreless innings of relief against the Milwaukee Braves." Sandy Koufax strikes out 14 for first big league win against Reds. Larry Sherry pitches 5 2/3 inning of scoreless relief to win Game 6 of the World Series for the Dodgers. Larry Sherry and his brother Norm become the 10th brother battery in major-league history. Larry gets the win with Norm hitting the game-winning homer in the 11th. Sandy Koufax pitches a 1-0 perfect game against the Cubs. Sandy Koufax elects to skip his start in Game 1 of the World Series in observance of Yom Kippur. Pitching on two-days rest, Koufax wins Game 7 over the Twins. In the first big league in which both starting pitchers are Jewish, Ken Holtzman loses a bid for a no-hitter in the ninth inning, but still beats Koufax and Dodgers, 2-1. Sandy Koufax announces his retirement from baseball. Yankees select Ron Blomberg with first pick in MLB draft. 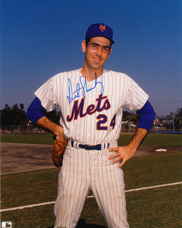 Ken Holtzman first no-hitter against Atlanta. "Saul Rogovin posted an American League leading 2.78 ERA for the Detroit Tigers in 1951." "Starting with perfect game, Koufax had 5 complete games, 4 shutouts in final 7 starts; 1.17 ERA in 54 innings, with 64 Ks." Al Rosen became the only former MVP to also earn baseball's Executive of the Year award. He won as general manager of the San Francisco Giants in 1989. 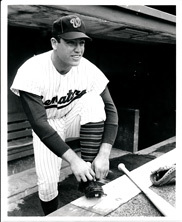 Art Shamsky tied a major league record by hitting homers in four consecutive at bats for the Reds on Aug. 12 and 14, 1966.